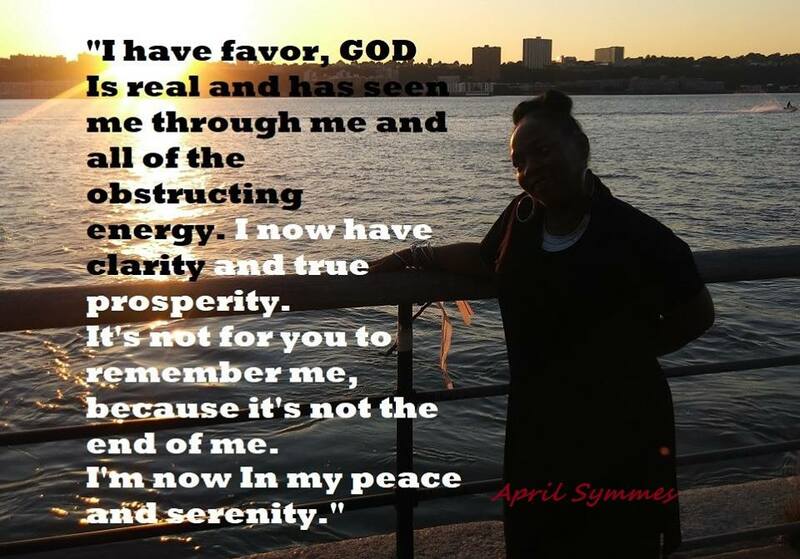 "Im April Symmes, I am in peace and its the peace I release. I've received the love of which I've always believed. I am free to be and can extremely breathe. The happiness I have so there is no need to grieve. See me as you know of me to be. I am of music, harmony and the melodies that fill your dreams. I was blinded by the unGodliness that surrounded me. I now have a flight over the captivity, and I can finally see. There was a mess in the flesh, overwhelming my structure, and attempting to alter my best, but I'm blessed.I received love, although there was a time, I thought I would never know what this was. 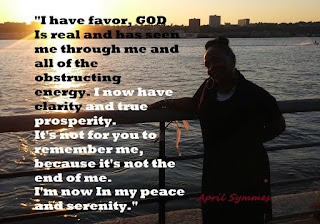 I have favor, GOD Is real and has seen me through me and all of the obstructing energy. I now have clarity and true prosperity. It's not for you to remember me, because it's not the end of me. Hygiene is important, mostly because it's healthy and unhealthiness is contagious. The way a person carries themselves externally reflects their actual internal for the most part. Being unhealthy externally shows there is some unhealthiness internally. The agreements a person make with themselves will determine what they believe, and in turn, these beliefs will become their reality. For instance, if you feel and believe you're not attractive, you are going to carry yourself as such. You might say to yourself, "Why should I dress nice? Why should I do my hair? It won't look good on me anyway, and besides, no one is paying attention to me." What one should realize is, true real beauty is internal and when you're healthy inside and have good feelings, beliefs, and agreements with yourself, it will reflect externally. You would be smiling, laughing, looking and smelling good, as many, if not most people would be attracted to you. People would love the energy. 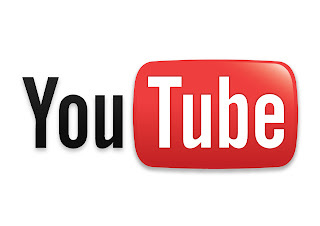 People would love to be around you, sharing your environment. When it was said, "cleanliness is next to Godliness", it didn't just refer to your external, it mostly refers to your internal. A person's soul is their actual. 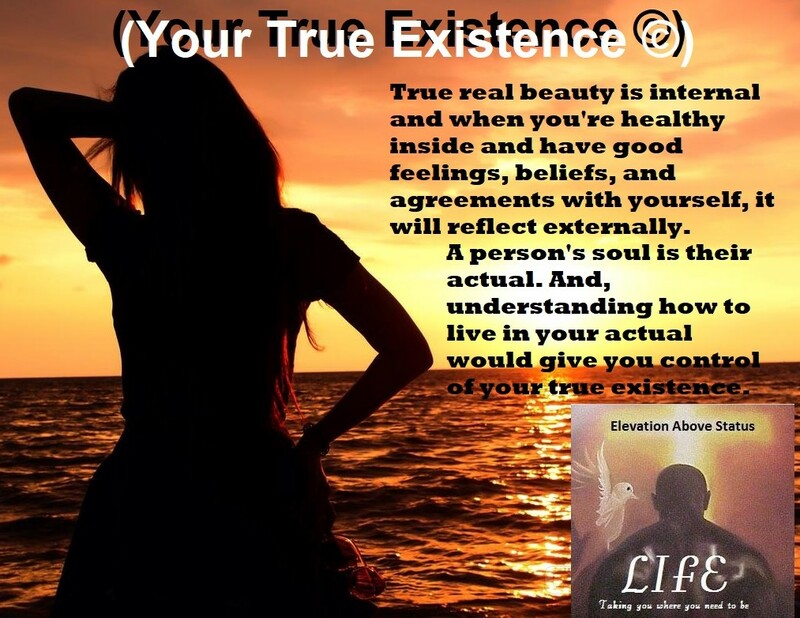 And, understanding how to live in your actual would give you control of your true existence. I'm fine today because in it I live like life is just today and only. There is no tomorrow because when it's due to arrive it will still be today, as yesterday was. 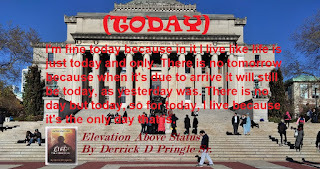 There is no day but today, so for today, I live because it's the only day that is. I love all that I love today, as I see all in today, I breathe all in today because today is all that is. I speak to all I believe and exist not to deceive because the truth is all that is free, as it is love. 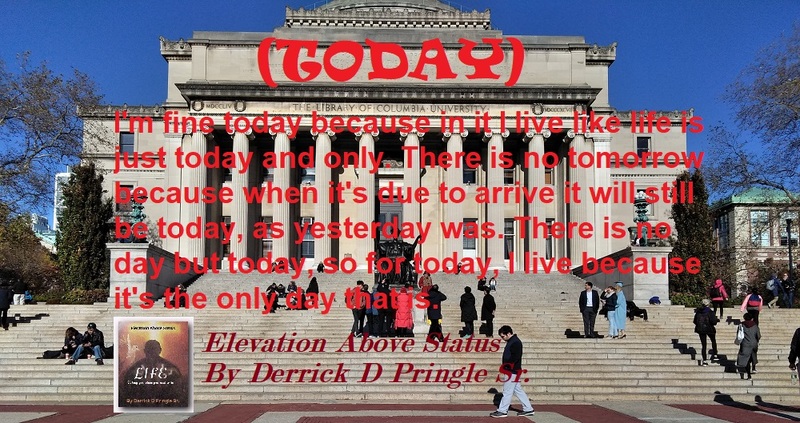 There is no time but now because all will be defined by it and now will determine your today and today will determine your life, so live as there is no day but today and wake up in peace feeling right, knowing that you've lived your life, today. The Time We Share © (Poem) By Derrick D Pringle Sr. 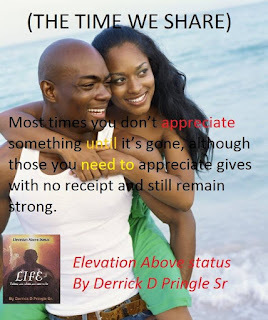 Most times you don’t appreciate something until it’s gone, although those you need to appreciate gives with no receipt and still remain strong. I’m grateful and will live to be all I can, as I’m humble and have the task of being a man. My challenges will always guide me to love and give all the glory to Our God above. You are grace and you are my life, and for me to forsake my gift will not be right. I fight I strive and I remain with a powerful drive, as today I understand why I’m alive. God has blessed me with the experience to feel his love. I have changed from yesterday and will prove to be different from who I was. Not saying I was bad or disregard what I have, but today is a new start and I can’t be mad. 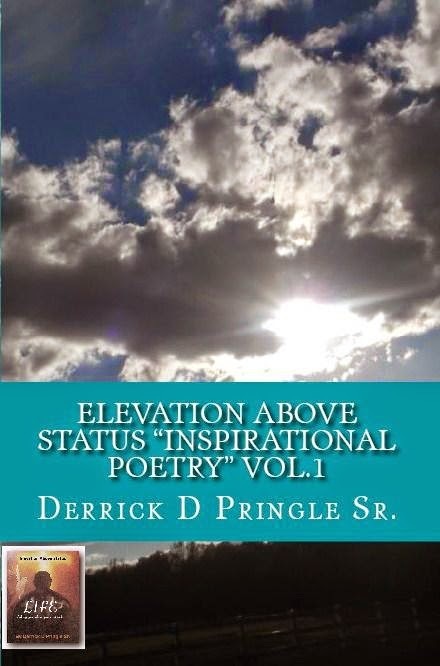 I rebuke Satan and all he has to offer, as I am a son of God, gifted to be an Author. Happiness is something that can’t be replaced; I will never change my desire or reconstruct my faith. God doesn’t make any mistakes, so only on him, I wait; I depend on nothing but the stability of the love we create. There is a power that can’t be devoured, so I stay in the comfort of his everlasting peace shower. We can’t go wrong, as long as we hold on, even though they keep playing that same song. I can’t get ahead, they’re holding me back, and I can’t focus straight because I’m always under attack. I know at the times of peace we must prepare for war, and if it’s not rough it’s not right and that wisdom I adore. You will always get the bitter end of the stick and be encouraged not to care, as I am always grateful and loving, because I’m educated in the time we share. I think of all the times I've apologized for the many lies, all the times I've made you cry and wasn't there to wipe your eyes. I know now what I should have known then, and if I've known then, my lies would have never been. I never thought or wanted to hurt you, less give you heartache or even make you blue. My love is sincere, and my soul is here with a genuine love for us, as I'll do anything to show this if I must. So many mistakes I've made in my life, and I will forever continue to make this right. I will desire your love, for as longs as I live, and always condition my love to give. What we have is pure, and the only harmony is what I want of you to endure. My mind has changed and I'm praying for your love to be my cane, and not estranged. My days are bright because you're in my life, and all I've ever wanted was of you to be my wife. I can hear you speaking now saying, “if you felt that way, you would have treated me right”. I really did my best, although I know my best wasn't enough, baby living without you is so tough and I never thought it could get this rough. With you away from me only brings me pain and if this doesn't change I'll never be the same. My heart hurts with every breath I take and I feel miserable with every day I awake. Would you please come back home, because I am so tired of being alone. I feel like a lost child, but I'm fully grown, as I know I've made this bed I have to lay on, I can't sleep because you're gone. 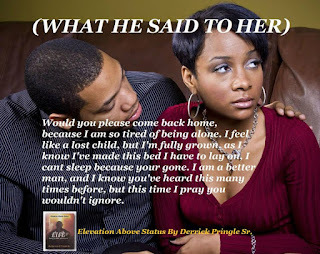 I am a better man, and I know you've heard this many times before, but this time I pray you wouldn't ignore. My friends keep telling me I'm living my life in fantasy because I feel like a kitten and you're my fur. Although I can see clear, the vision of us is in a blur. I often hear my friends make fun of me to others, saying, “you won't believe what he said to her”. Disappointment is a hurting feeling because you were a participant, and your heart was willing. The expectations can be alluring and chilling, although you should have been aware of the hand your dealing. Like rolling the dice on a Los Vegas romance, you played your hand and took a chance. Nothing is promised, as the next day you awake, similar to keeping your balance with the next step you take. A direction is your world and everything in it you claim to stake, if you're not sure of the outcome, you are advised to wait. 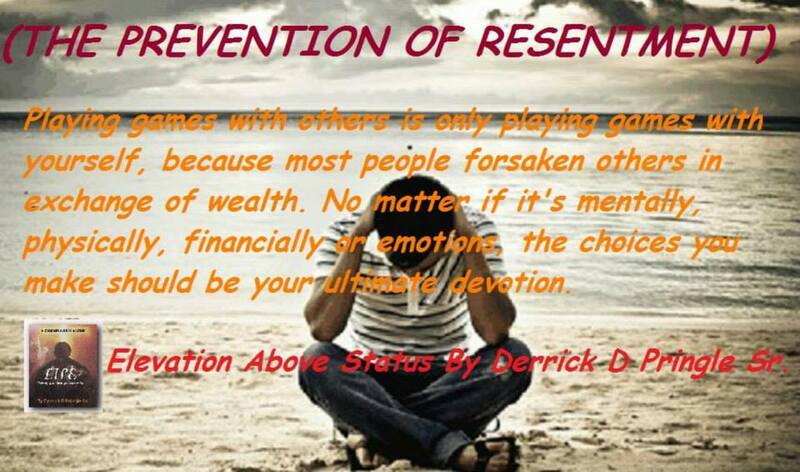 Playing games with others is only playing games with yourself because most people have forsaken others in exchange for wealth. 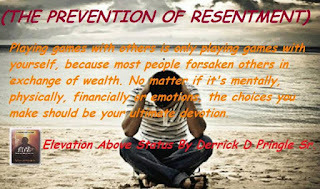 No matter if it's mentally, physically, financially or emotions, the choices you make should be your ultimate devotion. The results in decisions will only be what they will, and the world moves on, while you choose to stay still, contemplating and frustrating on the circumstances of your position, although it's making you sick, you are your only physician. There is no room for regret because the memories you'll never forget, along with the thought of what you've let. Be proud of who you are because you are rare by far, and no one can compare to the illumination of your star. There is nothing like love and the power of self-control while remaining focused and concentrating on your goals. No matter what you do be aware of your commitment and never be afraid to be silent and listen. Stubbornness is like a rock and against another it causes friction, if you'll understand this you'll obtain the prevention of resentment.